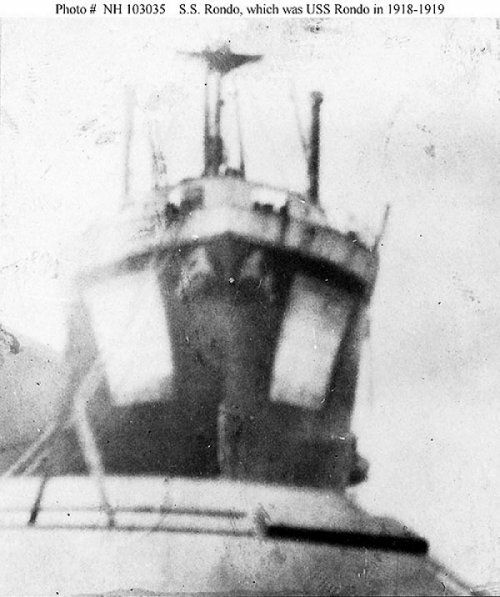 Depth of hold 35' 7"
55k In port, possibly when inspected by the Third Naval District on 25 March 1918. 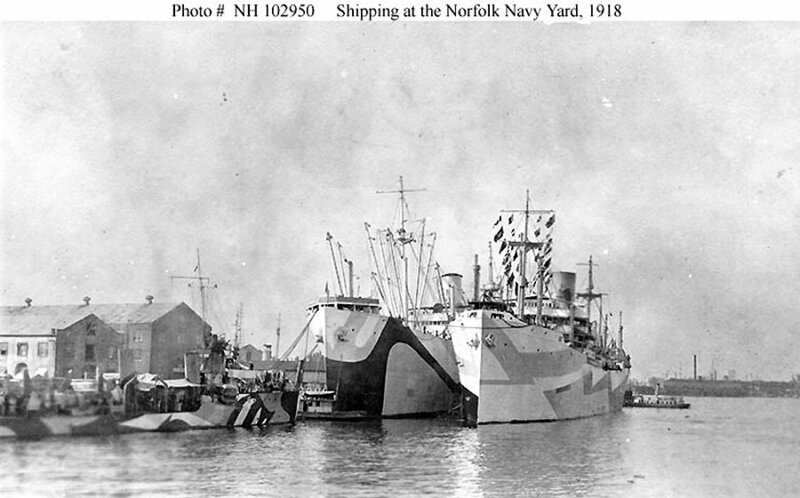 97k Ships at the Norfolk Navy Yard, Portsmouth, Virginia circa October 1918. They are (from left to right): USS Paul Jones (Destroyer No. 10); USS Katrina Luckenbach (ID 3020); and Rondo. All are painted in pattern camouflage. Collection of Arthur J. Rozett. 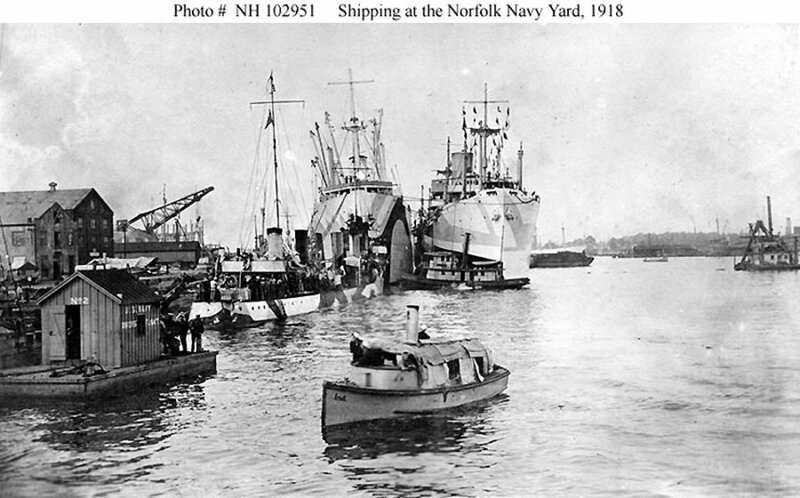 121k Ships at the Norfolk Navy Yard, Portsmouth, Virginia circa October 1918. They are (from left to right): USS Paul Jones (Destroyer No. 10); USS Katrina Luckenbach (ID 3020); and Rondo. All three are wearing pattern camouflage. A steam launch from USS Indiana (Battleship No. 1) is in the center foreground. U.S. Navy Divers Float No. 2 is in the left foreground. All are painted in pattern camouflage. Dictionary of American Naval Fighting Ships: The second Rondo was launched during 1914 by Rotterdam DroogDock Maatsehappij as a steel freighter for the Nederland Stoomvaart Maatsehappij and interned during World War I at New York. She was seized during March 1918 by customs officials along with 88 other Dutch ships, 31 of which entered U.S. naval service. Rondo was commissioned 28 March 1918 for service in the Naval Overseas Transportation Service Lt. Comdr. Paul C. Grening, USNRF, in command. 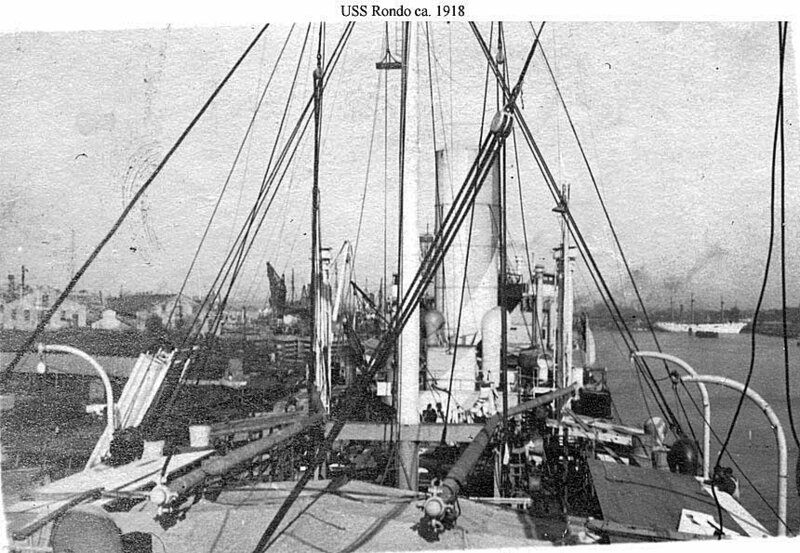 Departing New York 12 April 1918, Rondo steamed to Norfolk to load Army supplies for U.S. forces in Europe. 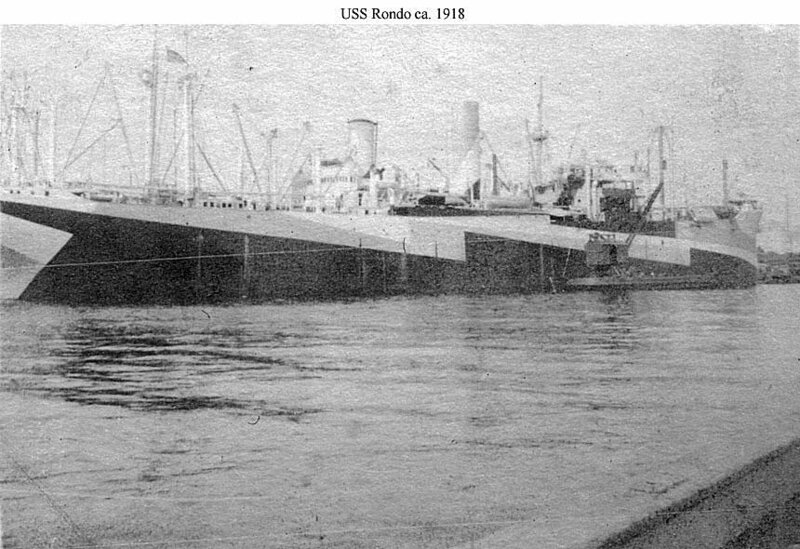 Rondo subsequently made two round-trip convoy voyages across the Atlantic between 7 May and 5 September 1918, unloading cargo at La Pallice, Verdon, and Bordeaux, France. Rondo was fitted for service as a horse transport during September 1918 under U.S. Shipping Board account. As an animal transport, she made one voyage to Montevideo, Uruguay, arriving 16 February 1919. Returning northward to Boston to unload her cargo, Rondo was later assigned duty carrying food to Europe. After engine trouble once forced her back into port, Rondo reached Falmouth, England, 28 May 1919. Steaming on to Amsterdam, Rondo was decommissioned and returned to her owner 21 June 1919. Rondo remained in Nederland Stoomvaart Maatsehappij service until scrapped during 1933.